Paperback available from Virgin Books. Water covers 71 per cent of the Earth’s surface, making ours a blue and white planet, gleaming in space. The seemingly boundless ocean feeds water vapour into the atmosphere, from which it falls as rain – ultimately our only source of fresh water, the most precious substance on Earth. But with global warming, the seas are getting too hot, and the weather increasingly erratic as warm water feeds more energy and moisture into the air. Even in the past, some land areas were desperately dry and others flood-prone, but these tendencies are now deepening as well as shifting from place to place. On top of this we’ve been mismanaging the ecosystems that regulate the availability of fresh water, and polluting what we do have. As a result, well over a billion people lack access to a safe water supply, the amount of drinking water available is shrinking, and the growth in demand for fresh water is increasing relentlessly. We are approaching a global water emergency. But how did we get into this situation, and what can we do about it? 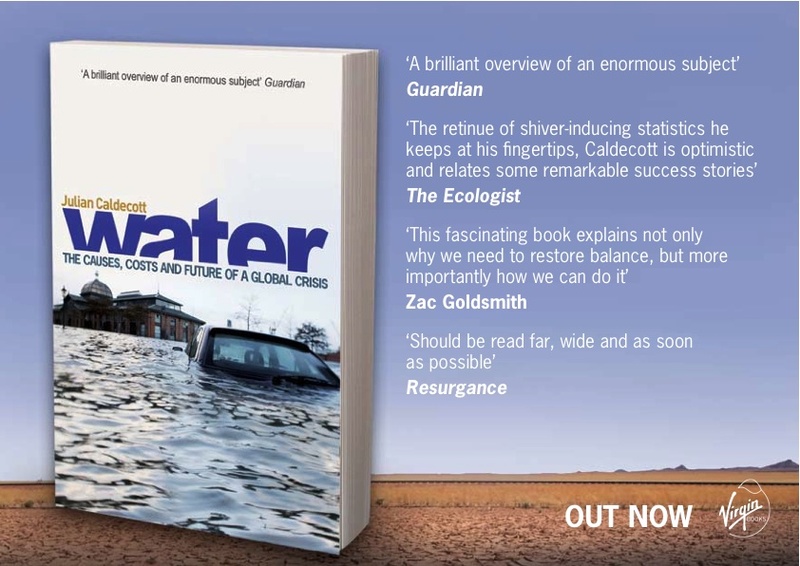 In this book, Julian Caldecott reveals where the water we use comes from, and at what social and environmental cost. He explains the history, science, economics and politics behind the looming water crisis, what the future is likely to hold if we do too little, and what we can all do to make a difference. “This fascinating book explains not only why we need to restore balance, but more importantly how we can do it.” – from the Foreword by Zac Goldsmith, Director of The Ecologist. “a prophetic read” – Edward P. Echlin, ecological theologian and author of The Cosmic Circle. “includes a lucid presentation of the Aquatic Ape Theory … The book shows that we can avoid disaster if we come to our senses and give Gaia a helping hand” – Elaine Morgan, evolutionary anthropologist and author of The Descent of Woman and The Scars of Evolution.